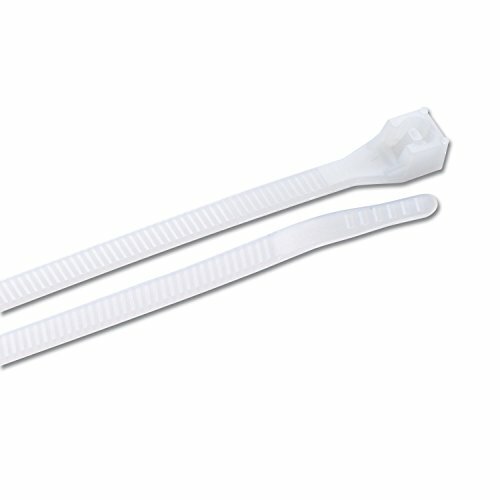 Gardner Bender's Patented Double Lock Cable ties are designed for strength, durability and reliability. Ideal for all bundling purposes; wires, cables, hoses, or ducts, you name it, and these ties will bundle it. Made from durable 100 percent nylon 6/6 material, these ties feature our patented Double Lock design, with locking teeth on both sides of the tie and at the head ensuring a stronger connection and 50 percent greater tensile strength than the industry standard. The bent tip ensures easy insertion into the tie head while close serrations on both sides of the tie promote precise adjustment. The smooth radiused edges ensure easy "slip" as you tighten while finger grips on the end ensure a secure and comfortable grip when hand-tightening. Investigated using particular requirements that allowed it to be a UL recognized component and with a serviceable temperature range from 0°C to 85°C (32°F to 185°F) these ties are designed to last. If you want a high quality product that will fulfill all your application needs, then choose Gardner Bender DoubleLock cable ties.